Born in Yorkshire and grew up loving animals and the countryside, as well as reading. She always wanted to be a writer and is now one of the UK's best selling children's authors, specialising in stories about the animals she knows and loves. Still lives in Yorkshire with her family and two Russian Blue cats. Her favourite animals are cats! Best known for the highly popular Animal Ark series which she created (although she didn't write every title; some were ghost-written by other authors, two such suggested authors being Liss Norton and American writer Ben Bagio). A few of the Animal Ark titles were horse-related (see below) but she also wrote another dedicated pony series known either as the Perfect Ponies or Horseshoe series. An excellent series, perhaps the author's best work. Aimed at a slightly older readership than the Animal Ark books, certainly the style is not too simplistic for adults to enjoy. Due to financial problems, a family's three ponies Faith, Hope and Charity must be sold. Josie sets out to find good homes for them, hoping against hope a miracle will happen and they will be able to stay. A quite unusual plot while still along the lines of a traditional pony series. 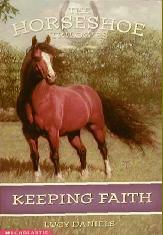 SUMMARY: Faith was the first pony Josie ever rode and is now an elderly lady. How can Josie find her a home with the peace and quiet she needs? SUMMARY: Hope is a lovely natured pony but is she too plain to find a loving home? 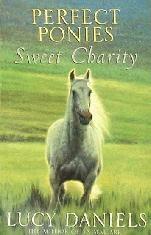 SUMMARY: Charity is Josie's very own special pony...how can she ever let her go? A nice large hardback omnibus edition containing all three stories. Slightly harder to find than the Animal Ark books. All except the hardback omnibus edition are paperbacks. 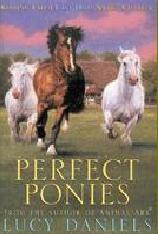 Depending on which printing, the series is alternatively called Perfect Ponies or the Horseshoe Trilogy, and also the first book in the series can be found under two different titles (see above) but the books are still the same. 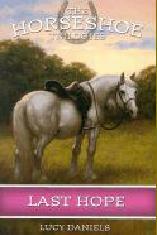 Some of the titles are about horses and ponies which I have listed below. Please note some of the series are ghost-written by other authors, not sure which ones though! All paperbacks. All fairly easy to get hold of and most are still in print.